Though many smoothies contain ice cream, sherbet, chocolate and other fatty and sugary ingredients, the refreshing treat doesn't need to be a calorie bomb that supplies little in the way of nutrition. Instead, use a smoothie as a way to boost your intake of protein, fiber and essential vitamins and minerals. Incorporate a variety of nutrient-dense foods and vitamin supplements, and discover that it's simple to prepare a healthy smoothie that also tastes delicious. Prepare your smoothie as you normally would. Use fresh fruit and 100 percent fruit juice to keep the smoothie as nutritious as possible. Replace the ice cream with plain, nonfat yogurt, which will cut the fat and sugar content but will also add vitamins A and D to your smoothie. Pour 2 or 3 tablespoons of milk into your smoothie and puree to combine. Cow's milk, soy milk, almond milk and rice milk will each add small amounts of key vitamins, such as vitamins A and D, to your smoothie blend. Add fresh vegetables to your smoothie. 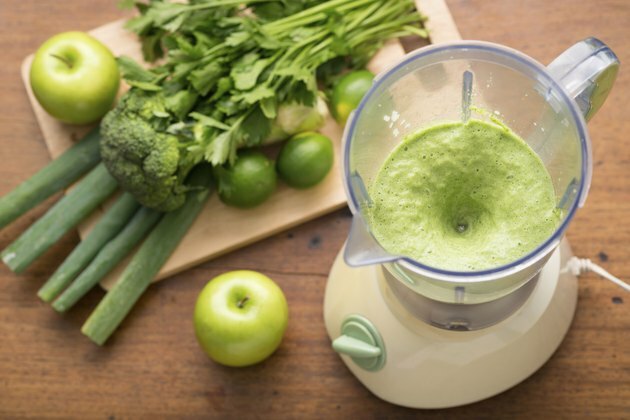 Most smoothies are made with fresh fruit, which is packed with vitamins, but pureeing vegetables into your smoothie is another way to blend vitamins into it. Add spinach, kale or carrots for a dose of vitamins A and K or sweet bell peppers to boost the vitamin C content of your smoothie. Scoop powdered vitamin supplements into your smoothie. These are available at many health foods stores, and they add a significant boost of nutrients to your smoothie. Puree the smoothie well after adding the powder to be sure it's well-incorporated into the rest of the ingredients. Include liquid vitamins in your smoothie instead of powders. Many of these are flavored, so they will enhance the taste of your smoothie while also adding a wealth of vitamins such as A, C and K, as well as folate and vitamin B-6. Replace a portion of the juice that you would normally use with the liquid vitamins to keep your smoothie from getting too thin and runny. You might also add protein, fiber and mineral supplements to your smoothies to punch up the nutritional value even more. Always talk to your doctor about the risks and benefits of using powdered or liquid supplements in your smoothies. Certain nutrients, such as vitamin A, can be dangerous in large doses, and your doctor can recommend the appropriate amount for you.